Ahead of the 2019 general election, the fiery Catholic Priest, Rev Fr. Ejike Mbaka yesterday endorsed Governors David Umahi of Ebonyi State and Ifeanyi Ugwuanyi of Enugu state for second term in office, citing unquantifiable development and empowerment as reasons. He said Umahi through his uncommon transformation has made Ebonyi state the best state in the country and fastest growing economy in the entire zone and called on all opposition to allow the governor complete his good works. 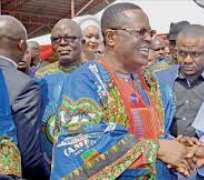 Speaking while declaring open the 2018 Harvest and Thanksgiving, Governor David Umahi said he was fulfilling the promise he made to Ndi Ebonyi during his electioneering campaign of leading the state with fear of God and prospering the state with word of God to become the industrial hub of the entire country. He said he came to Adoration ground for the first time by the invitation of Fr. Mbaka and promised to return to the Adoration ground and build a project in the place on behalf of the state government. Governor Umahi was accompanied by his wife, Rachel Umahi, deputy Governor, Dr. Kelechi Igwe and wife, Speaker and members of Ebonyi State House of Assembly, Executive Council members and National Assembly members as well as traditional rulers and elders of the state among others.